Momiji had given birth on July 12th to two baby boys, Choco and Doughnut. Three days later when the keepers arrived at the capybara enclosure early on the morning of July 15th they found a tiny little baby capybara wandering around. After inspecting all the adult capybaras they decided Ayu must be the mother as there was a tell-tale drop of blood on her bottom. She had not produced any milk so there had been no visual indication (swollen mammary glands) to give them a clue that she was pregnant. 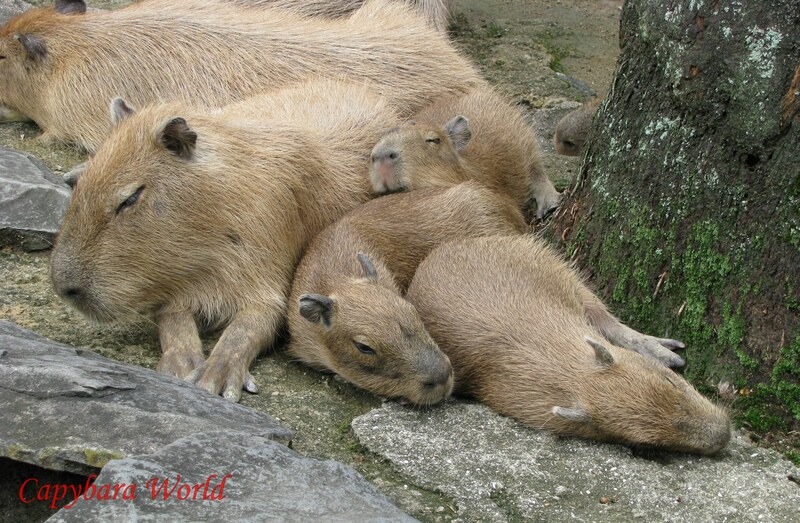 Toku, the new boss capybara at Nagasaki Bio Park, is the father. Donguri, the great matriarch of the Bio Park herd and the most important capybara in Japan (in my opinion! ), is their grandmother (Or in Macaroni’s case great grandmother). Since Ayu wasn’t producing any milk little Macaroni, as he was called, moved in with Choco and Doughnut. In the wild mother capybaras communal nurse, called alloparenting (wherein any of the mother capybaras that have given birth will let any of the baby capybaras, not just their own babies, suckle), so it was quite natural for Momiji to take over the role of little Macaroni’s mother and let him suckle. Ayu was a regular visitor at Momiji’s enclosure sniffing her little baby, Macaroni, through the fence. I felt sorry for her and wondered what was going through her mind. 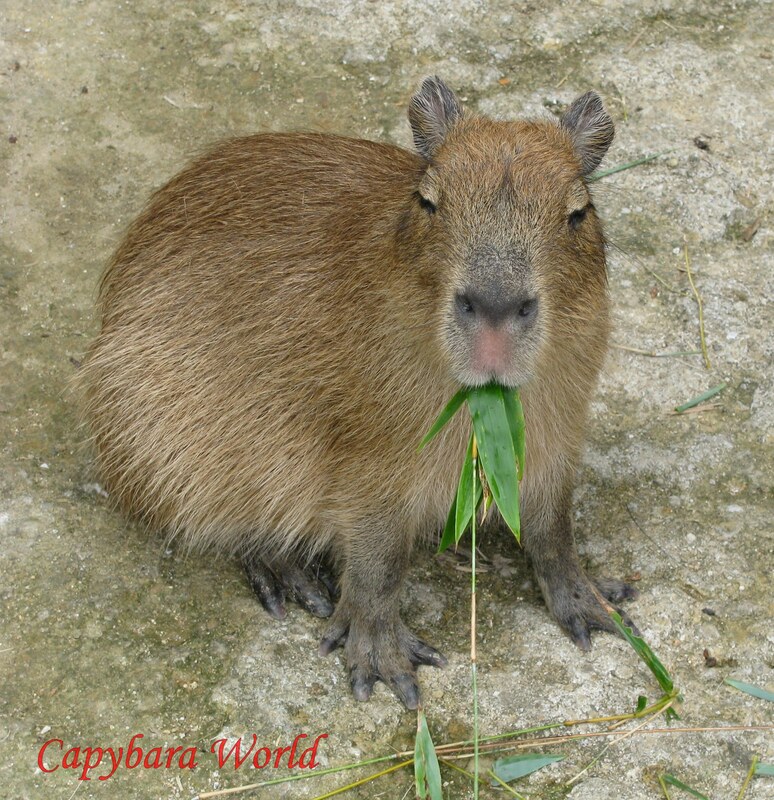 She is one of the sweetest, most gentle capybaras at the Biopark. Like Donguri she is disinclined to fight. She never attacked Momiji when Momiji rejoined the herd in the main enclosure, and it would be interesting to know if this was because of her pacifist nature or because Momiji was looking after her baby. 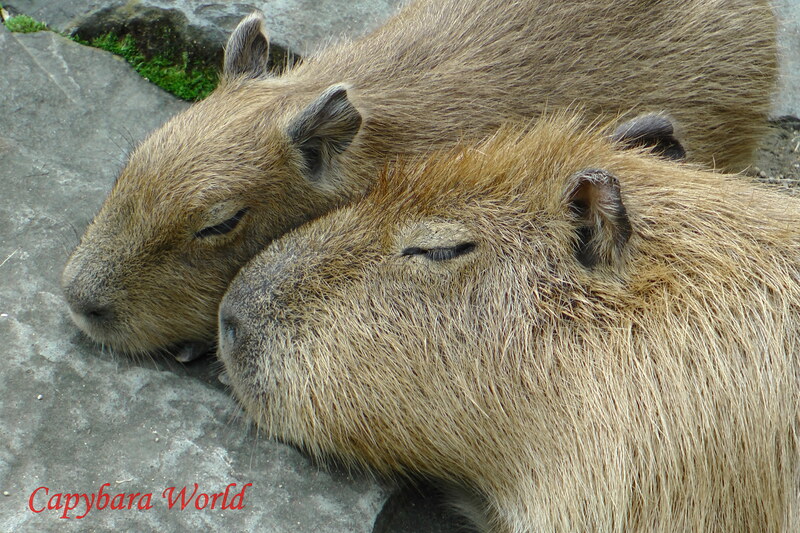 At the Biopark the female capybaras are removed from the main enclosure up to six weeks before they give birth (it is difficult to estimate with any accuracy the date on which a mother capybara will give birth, hence the long period of sequestration). Mother and babies then remain in a separate enclosure for about six weeks. The reason for this separation is so that no harm will come to the babies. However, there is then the problem of reintroducing the mother back into the herd. Momiji was attacked many times by Maple and Yasuha who wanted her place in the hierarchy. Momiji had been joint number two in the hierarchy with Hinase and Yasuha. Ayu was next in the hierarchy followed by Maple. 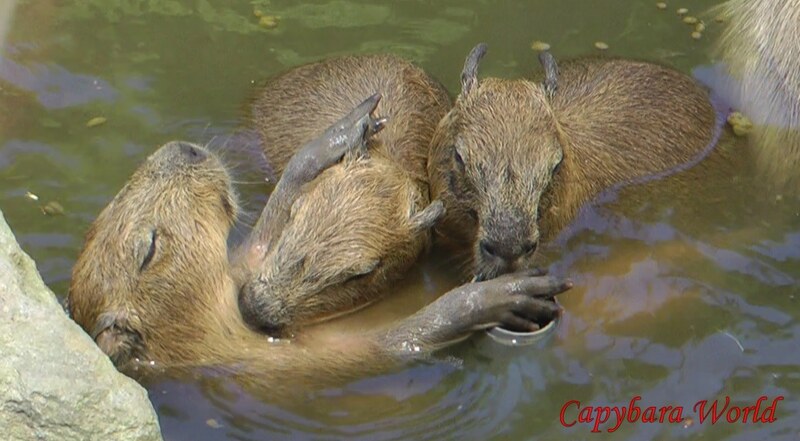 In South America, following extensive research, female capybaras are no longer separated prior to giving birth as the problems associated with reintroducing them into the herd are greater than any danger of infanticide. I spent many very enjoyable days watching Choco, Doughnut and Macaroni play together and clamber all over long suffering Momiji. 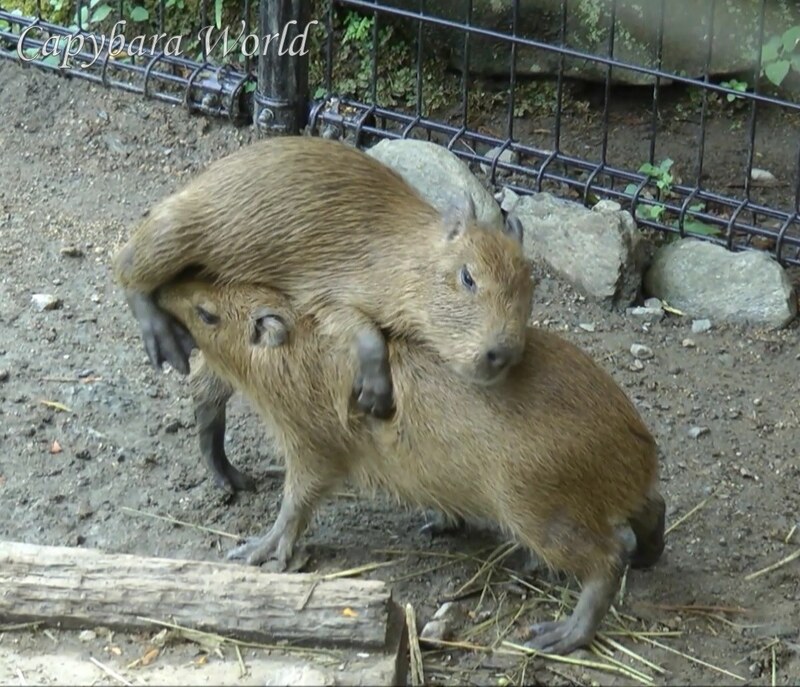 This is one of my favorite baby capybara videos: Doughnut being nibbled by Macaroni and Choco. Macaroni is the most enthusiastic nibbler. 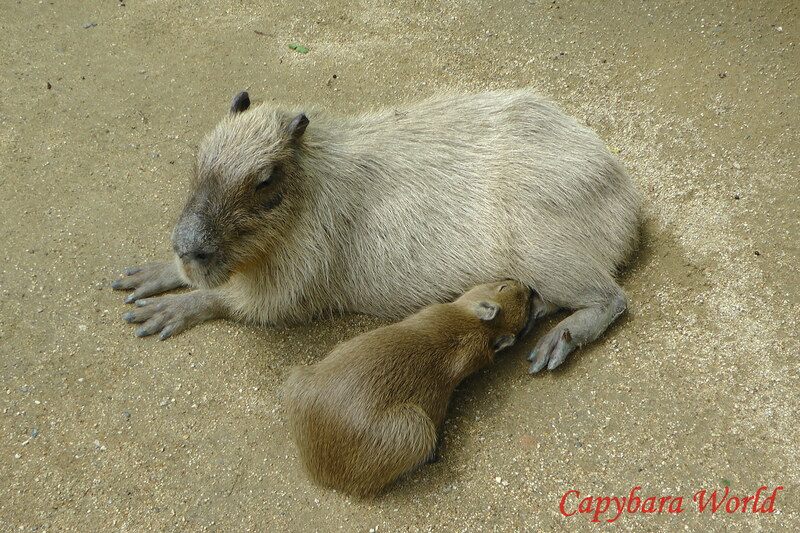 Choco, the baby capybara with the black scars, seems most like his mother Momiji. He has a more anxious personality and is not quite as physically strong as his brother Doughnut. He often calls plaintively for Momiji; he likes to be near her. Choco seems to have inherited Momiji’s intense and emotional personality. He was often the most responsive to petting. He also called the most and was very fretful when Momiji was in Toku’s enclosure mating with him. Choco couldn’t understand what was going on; “Why is Toku jumping on mummy and why has she been separated from us”. Later on I saw Choco practising Toku’s moves on his little brother Doughnut; clambering on top of him from the rear. All the babies are male. Choco often called Momiji when he was separated from her and couldn’t find her. At breakfast time he was the baby capybara who seemed to elicit the most aggression from the older capybaras when the babies tried to feed at the same food trough. On the day a film crew entered Momiji’s enclosure and frightened her, Choco was the baby who was most upset by their intrusion and suffered a large cut and several abrasions, just like Momiji herself. Momiji had obviously been frightened by the presence of strangers in her small enclosure and had tried to escape from the film crew. One time when I was petting Choco, he asked me if his name was “Kowai”. (“Kowai” means “cute” in Japanese). 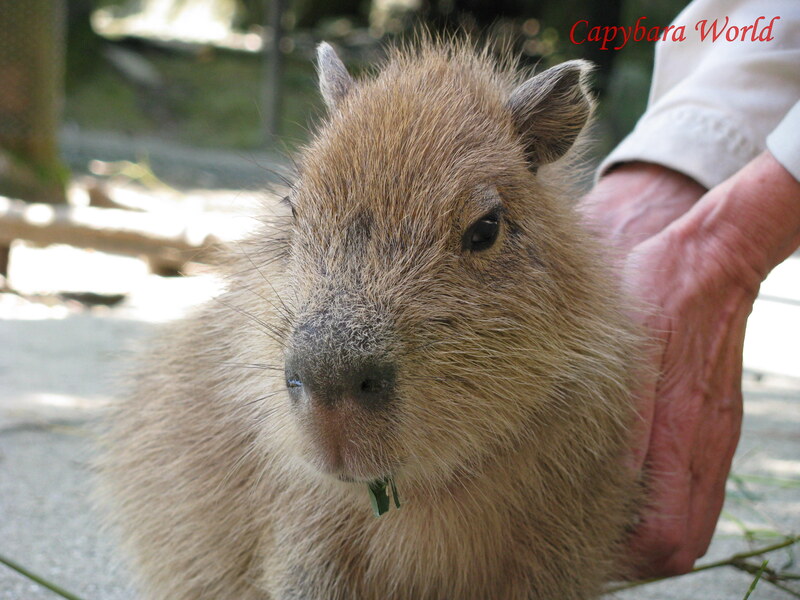 Momiji is a very restless capybara, wiry, fit and athletic. She seems to give herself one hundred percent to any activity, whether it is looking after her babies, suckling or making love to Toku. Doughnut is strong and calm by nature. He was able, on two occasions, to jump the two feet out of the empty pond, on the day the pond was emptied and cleaned, but little Choco and Macaroni, try as they might just could not manage it. It was heartbreaking to watch. Their little legs pounded and flailed as they tried to grip the top of the stone wall, but time and again they fell back, often landing awkwardly. I was so afraid one of them might break its little leg. Fortunately this drama occurred just before lunchtime, so while all the keepers and management who had been cleaning the pond were away, I was able to buy some bamboo and lure Momiji and her babies out of the empty pond on the opposite side where there were some stepping stones which allowed the baby capybaras to easily jump up. Macaroni, Ayu’s son, was a little smaller than Choco and Doughnut. He was fully accepted by Momiji and her babies but often chose not to play with them, probably because they were a little bigger than him. They almost always snuggled up to nap together. Macaroni also seemed to be living to a slightly different schedule with regard to eating and sleeping, so quite often while they were eating he would be sleeping. After Momiji and the babies joined the rest of the herd Macaroni seemed the most independent and brave, often going off completely on his own in the early days rather than staying near Momiji. Surprisingly he was the baby capybara who was most upset when Momiji went into Toku’s enclosure and the two of them were mating. Macaroni didn’t know what was going on and hated being separated. Between the ages of two weeks and five weeks, while still in the separate enclosure, Macaroni frequently had hiccups. When Choco, Doughnut and Macaroni rest together one of them often faces in the opposite direction to keep a lookout for predators. On August 24th, when the babies were about six weeks old, they were all released into the main enclosure. Momiji took them on a grand tour of the enclosure, which is large with a huge pond. They swam all the way round the pond and then Momiji tried to find them a quiet, resting spot away from the noisy people. First she tried Capuchin Island, but the monkeys came over to harass her. They then settled just outside their old, separate enclosure. 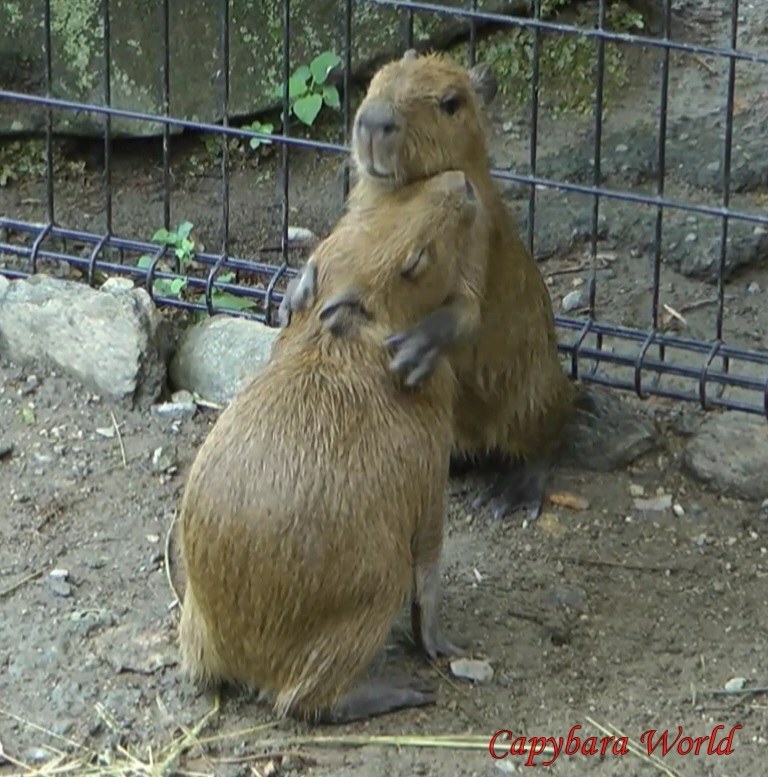 During the day Momiji and the babies were in the main enclosure so another female capybara was put in their little enclosure as the Biopark thought it was necessary to have that enclosure occupied. 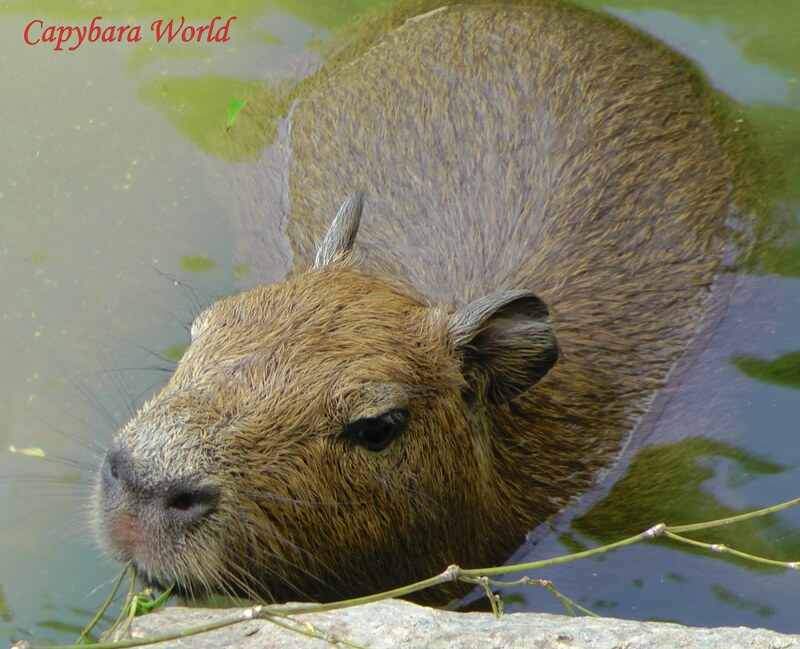 On the first day poor Ayu was trapped here, as she had been the first capybara to enter the enclosure when it was opened in the morning. No doubt she wanted to see little baby Macaroni, from whom she had been separated for six weeks. After a few days Maple and Yasuha were sequestered in this separate enclosure each day to prevent them from attacking Momiji. Yasuha soon learned that if she didn’t want to be separated from the herd she better stop fighting Momiji, but Maple never learned that. 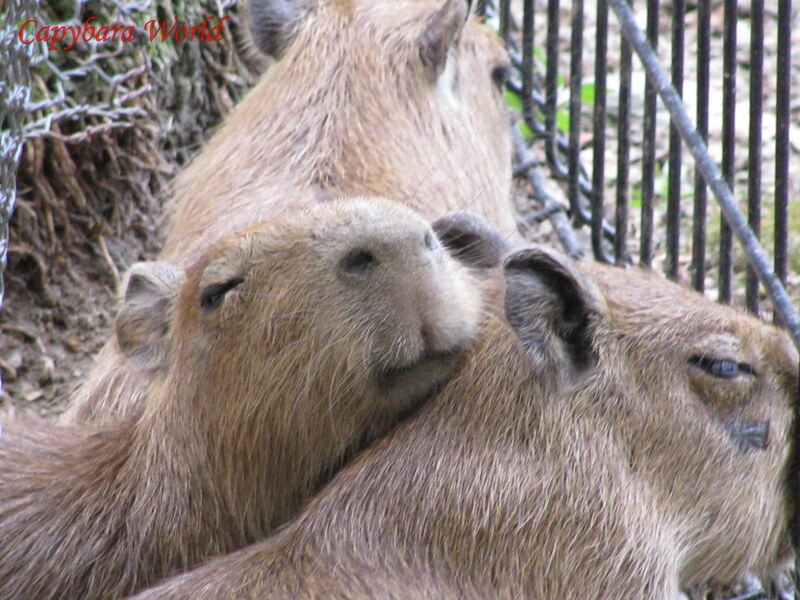 All the capybaras hate being separated from the main herd and find it very stressful. On that first day in the main enclosure Choco, Doughnut and Macaroni were very wary of the humans, but they wanted the food which the humans were offering. If anyone tried to pet them they quickly darted away. 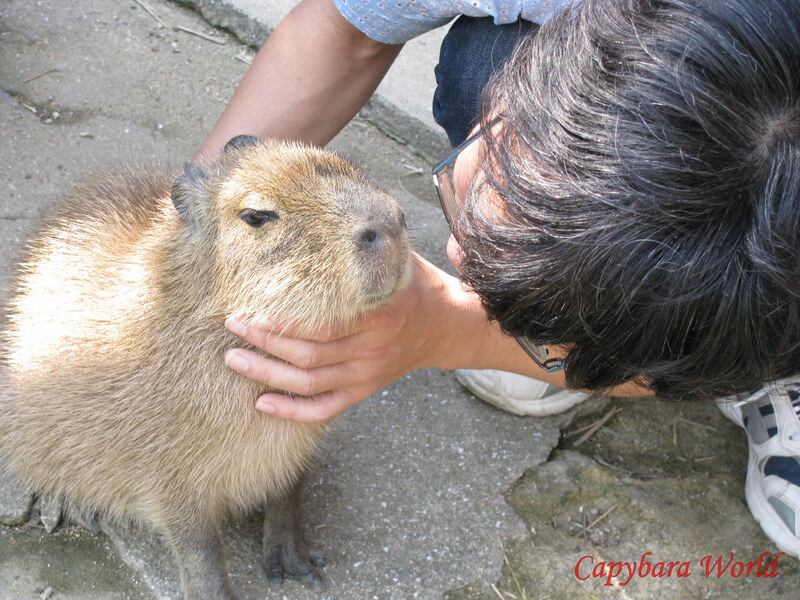 By the second day, those of us who know which areas of the capybaras’ body respond best to petting, were able from time to time to show them just how blissful being petted by a human could be. Within a few days the babies were completely relaxed in the company of even the most noisy and inexperienced capybara visitors. Interestingly, for the first 10 days or so the babies would not roll over on their backs when they were being petted, no matter how blissful they felt. Presumably they sensed the need to be able to run away quickly should danger present itself. However, once the babies decided they were completely safe in the large enclosure amongst the humans they rolled over whenever they went into that blissful state of ecstasy. 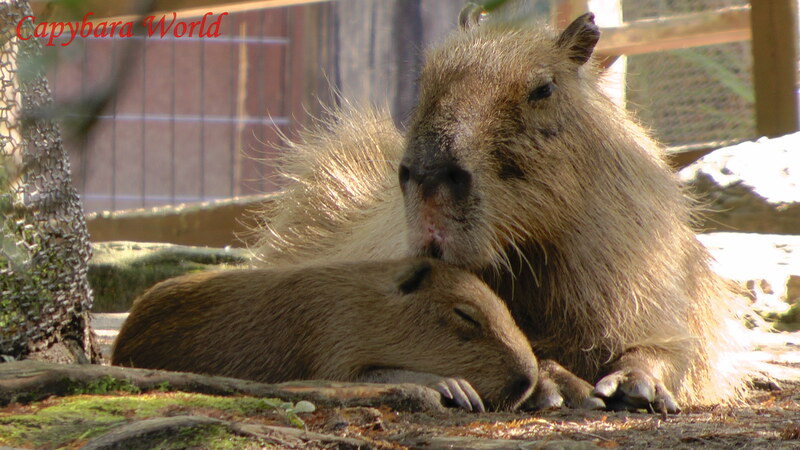 Baby capybaras are born ‘precocial’ which means they are developed when born, covered in hair with their eyes open and able to move normally. Although they suckle for 16 weeks they are able to eat grass etc. almost immediately. 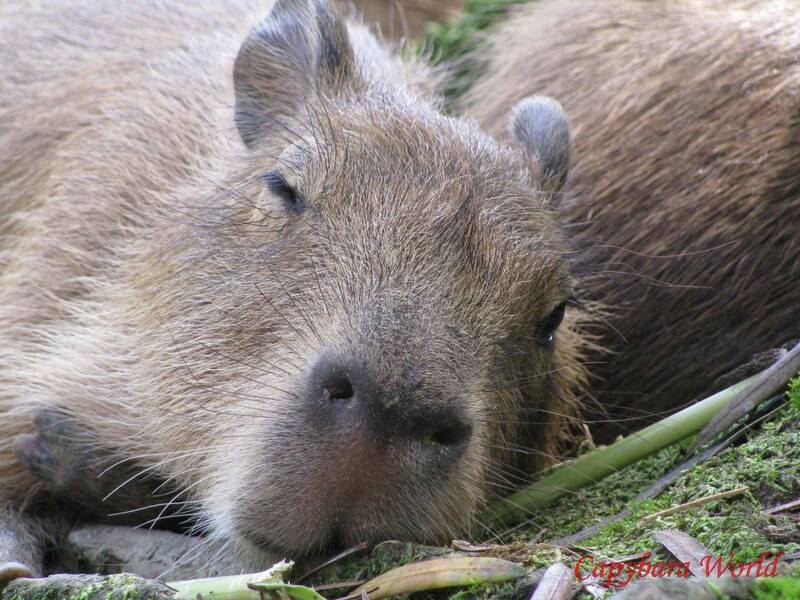 Baby capybaras weigh about 2 pounds, roughly 1 kg, at birth. On this wet, rainy Sunday she calls repeatedly to Toku. (Toku is the father of her babies). He immediately comes over to the fence separating them. At about 3 PM the keeper decides to let Momiji enter Toku’s enclosure, and Hinase is taken out. Hinase is not very happy about this, being supplanted by Momiji for a romantic engagement. Momiji was very willing and kept adopting the Lordosis position waiting for Toku to mount her. This went on for over an hour and Toku mounted her more than 15 times. You can hear her babies calling plaintively in the background. They were wondering why they couldn’t get to mummy, and what on earth was Toku doing to her. Choco and Doughnut even tried copying Toku, by mounting each other! At about 2 minutes 30 seconds you can see Momiji’s sister Kaede in the enclosure at the top of the hill, watching. In a later video you can see that after a while her babies plaintive cries, and the way they are gnawing on the fence begin to upset Momiji. Toku seemed to sense a change in her demeanour and looked concerned, hanging back with a puzzled expression on his face, wondering if he could mount her again. Is there an element of frustration in Toku’s barks?